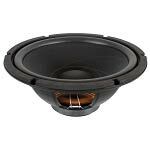 Velodyne: F-1500B, F-1500, F1500, FSR-15, FSR15, ULD-15, ULD15, ULD-15s7, ULD15s7, and many more! 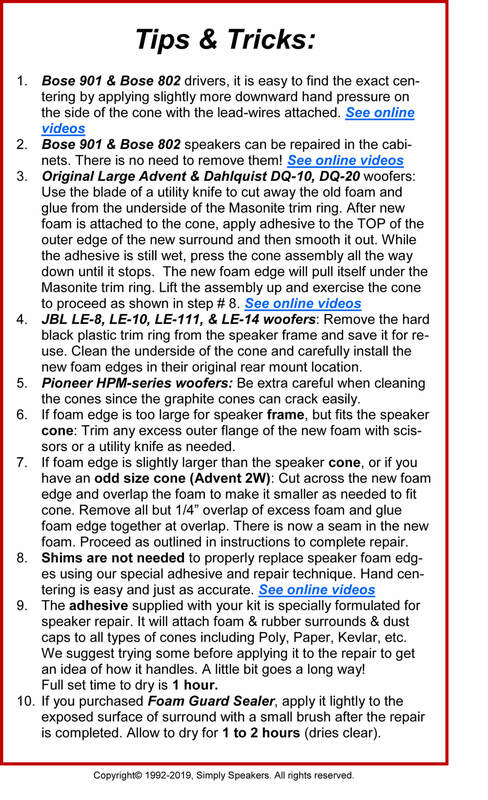 I have a beloved Velodyne 15" ULD-II subwoofer, which after 25 years finally gave into foam rot. I had the choice of buying a new Velodyne at $4300 or repairing the old one for $27. Even though I had spousal approval for both options, the choice was a no-brainer. It took a couple of hours to mount the new foam ring and gasket, following the clear instructions and video. Spent most of the time carefully cleaning off the old foam. After that it was just to be patient while the glue dried in 3 stages. My Velodyne sounds great again, and I saved a ridiculous amount of money. 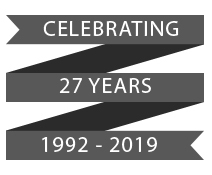 I sure hope Simply Speakers will still exist in 25 years, if I need to do it again. Thank you. 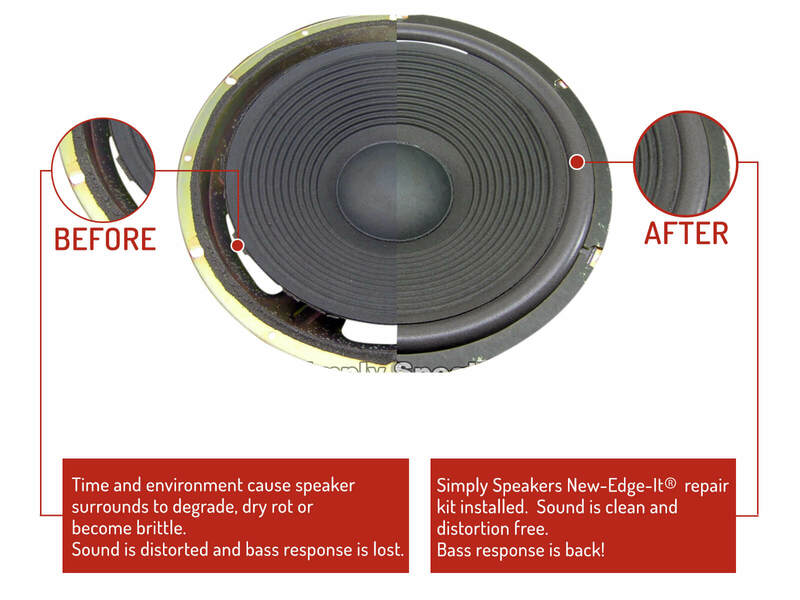 This is the second time I have ordered from simplyspeakers.com As before, the repair was easy, quick and effective. The hardest parts of the repair is scraping the old foam/glue off of the speaker cone & frame and on this 15 inch subwoofer holding the new foam in place until the glue dries to insure no gaps and a tight seal. Overall, if you follow the instructions you will have great results. Highly recommended and an enjoyable project. 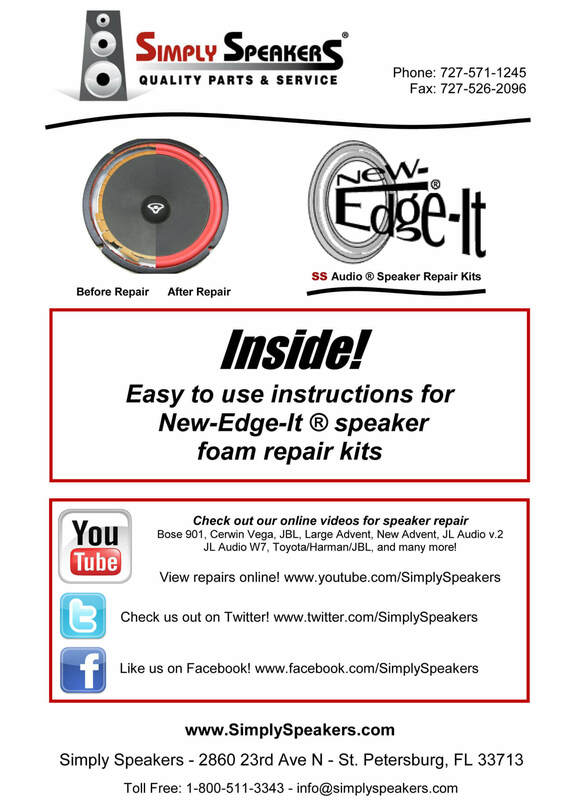 The repair kit along with your U-Tube video on how to use the kit to repair the speaker was straight forward not difficult. I completed the repair in less than an hour, excluding glue dry time and everything worked as advertised. The speaker now works good as new! The loss my subwoofer was breaking my heart as the foam had dried out after a lousy 25 years! I was very happy to find this foam repair kit it works great provided you don't rush, take your time and carefully remove the old material as shown and then glue the replacement in and let it set up. The sub sounds like new and now I've got a couple other speakers to fix! This is the ticket. I didn't get the foam ring on as symmetrical as I was trying for but it worked. Subwoofer sounds good again. Perfect fit. Sounds like new. I loved this kit. It looked exactly like the original I bought in 1993. Followed the well written instructions, and it came out perfectly. It performs as well as when it was new. Great find. After 25 years of great sound, my subwoofer "died" when the foam around the speaker disintegrated. Two up-scale audio places said it could not be repaired and offered a $1200.00 new replacement. 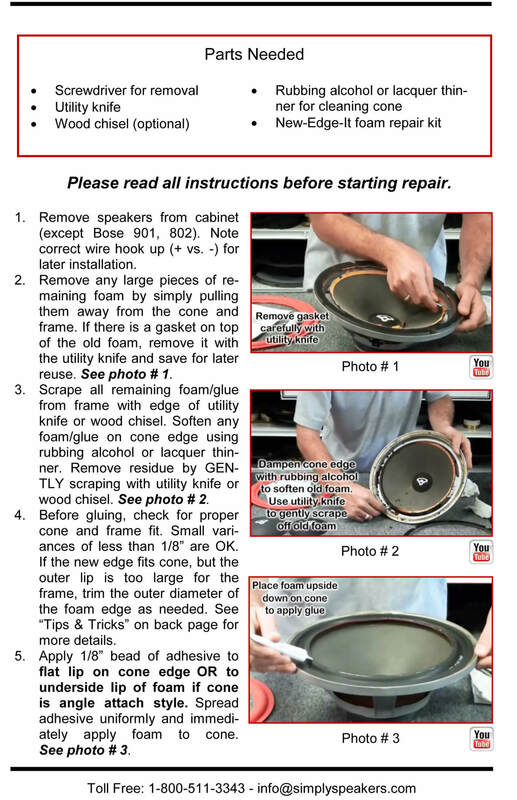 After a defiant Internet search and viewing a repair video from Simply Speakers, I bought the repair kit, received it promptly and followed the straight-forward instructions. For thirty plus dollars, this magnificent subwoofer has be resurrected. Thank you. After 25 years of faithful operation, my Velodyne F-1500's surround finally cracked. After a little internet searching I stumbled upon this kit. It's very reasonably priced, which is great! What sold me was the instructional video, which made it very clear how to perform the repair. Of course, the video makes it look foolproof, but there were a few minor issues for me: #1: The video demonstrates the repair using a speaker that is completely removed from its cabinet. In the case of my speaker, the wires are soldered in place both at the speaker and at the amplifier, vs. using connectors. As a means of minimizing the intrusiveness of this repair, I choose to NOT desolder the wires. This meant that I couldn't just spin the speaker in place and instead that *I* had to move around the speaker, making it a little more difficult to put an even bead of adhesive on the surround. #2: The adhesive set up a little more quickly than I had expected. You definitely need to work fast. And issue #1 made that a little challenging. 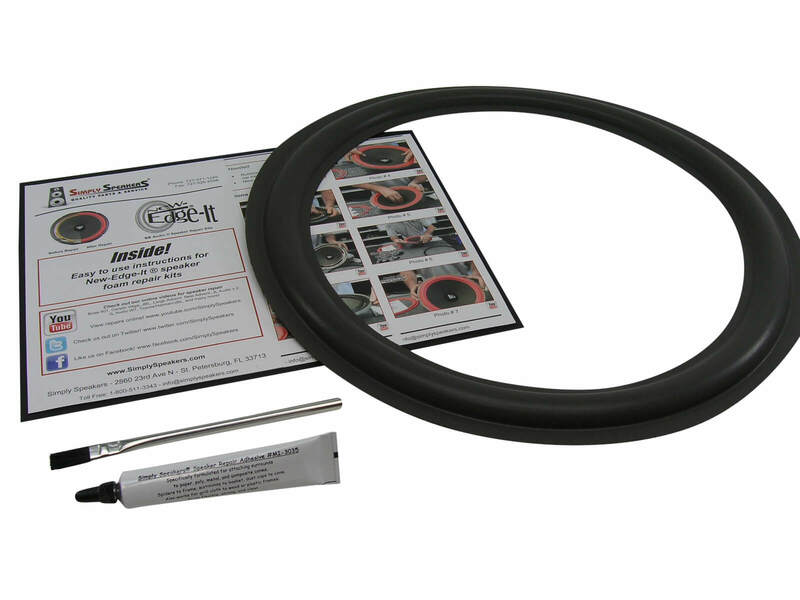 #3: The old surround had a slightly smaller inner diameter than this kit. To be clear, this kit is for a variety of speakers so it's not an exact OEM replacement. In the instructions that come with the kit, there is mention that if the new surround isn't sized right that you can effectively cut it then glue it back together with an overlap to reduce the diameter by a small amount. There was sufficient surface contact between the inner portion of the surround and the cone to make it work, but in hindsight I would have made a small adjustment to the new surround's diameter to provide more surface for bonding to the cone. 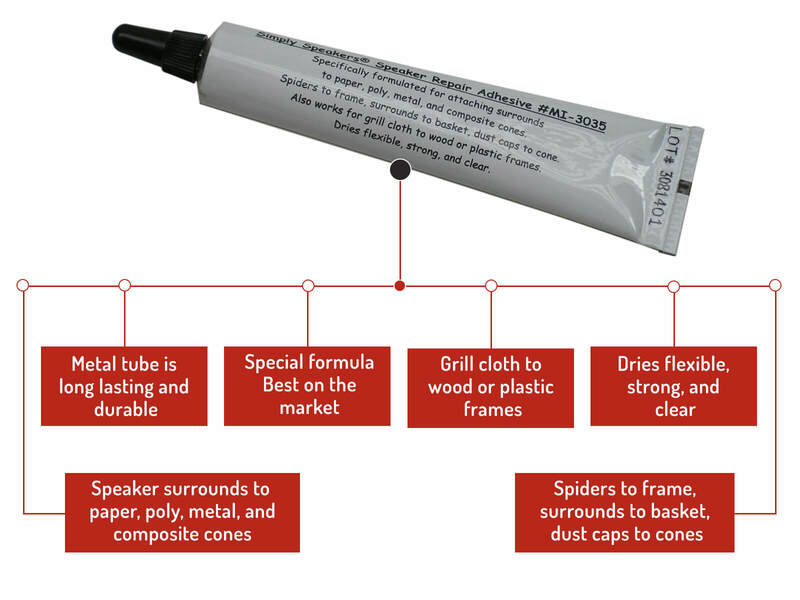 I also purchased the sealer, but I haven't applied it yet and so can't comment. In the end, I'm very pleased with the results of the kit. I hope that my comments above might help others understand what they're getting into and have a better repair experience. 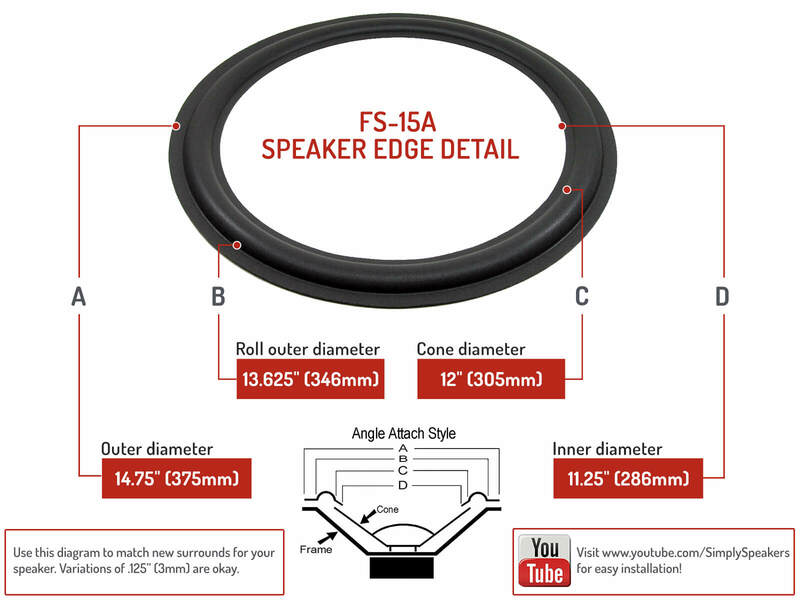 Q: I see a picture of a Velodyne ULD 15 speaker cone replacement/repair kit but no product for sale. How do I purchase the kit? A: Please scroll down, there is a buy button for the product after you choose all the options. Thanks! A: Yes! 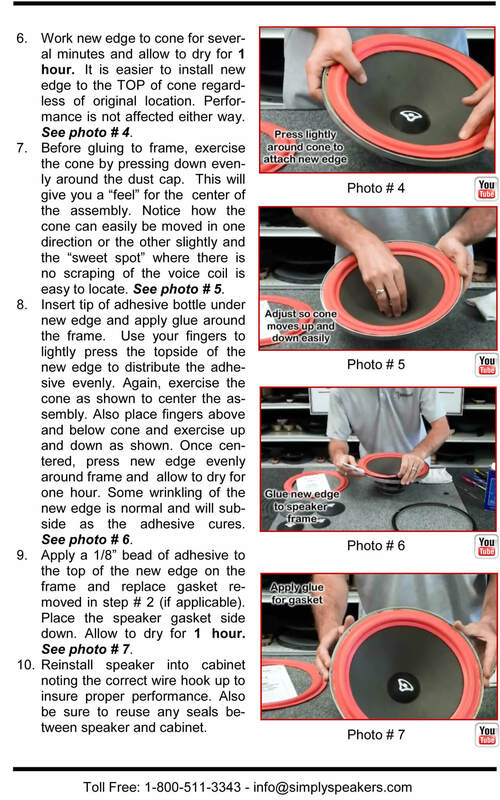 Instructions are included and we have several well made videos to help you too! The repair is perfect for any average do-it-yourselfer. Q: I'm going to buy your kit to repair my Velodyne ULD-15. I'm able to remove the old foam from the speaker rim and the very edge of the cone. However, there is a 3/8" wide flat piece of foam forming a circle around the edge of the cone. It's basically leftover foam that overlapped and provided the connection between the two surfaces. I cannot peel it off by hand, and don't want to ruin the cone paper. Is there a solvent I can use to remove this, or should the new foam surround be glued on top of what is there? Thanks for your reply! 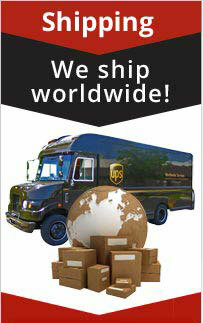 Velodyne: F-1500B, F-1500, F1500, FSR-15, FSR15,SF-15BVR20, SF15BVR20, ULD-15, ULD15, ULD-15s7, ULD15s7, and many more!